The gnu is an African antelope, bulky but compact. 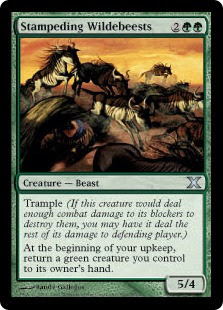 The gnu (or wildebeest), is an antelope that is the source of a number of monsters from the AD&D Monster Manual. A. The gnu appears as its normal, everyday self under the entry of Herd Animal. 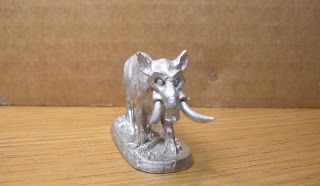 The only gnu in 25mm comes from the Veldt Animals set (Ral Partha 31-032). 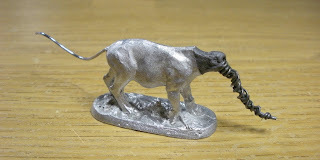 The miniatures are still available from Ral Partha Europe, and at one time, you could order single castings of the animals, but that may not be an option any more. B. 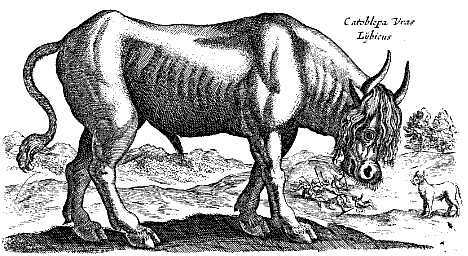 The D&D catoblepas can trace its origin to Pliny, and it is now believed to have been derived from second-hand accounts of the gnu. "...with a very heavy head which it carries with difficulty and it always hanging down to the ground. Otherwise it is deadly to humans, as all who see its eyes expire immediately." The only miniature of the catoblepas is from the Ral Partha AD&D line, but it is entirely too big (IMO), because the catoblepas is described as being the size of a bull. However, I stumbled upon some Ral Partha Skull Pigs for Werewolf: The Apocalypse (Ral Partha 69-025), which I thought would make a good start as the basis to create a figure modeled after Trampier's catoblepas from the Monster Manual. 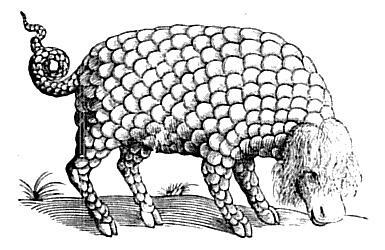 The Skull Pigs are roughly the size of a gnu, and the miniatures come in two poses, each composed of four pieces (body, head, and two tusks). So far, I have drilled some holes in the neck of one of the Skull Pigs, and glued several pieces of floral wire in the holes. I then bent the wires to form the neck. 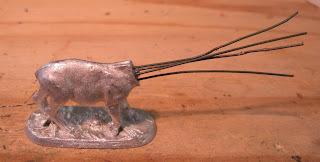 J-B STIK was used to firm up the connection between the body and the wire neck, and a paper clip tail was glued in place. The next step will be to modify the head, but just as a preview, I used some Elmer's-Tack to attach the Skull Pig head to the rest of the body. Sculpting the head will be the hardest part, but hopefully I'll be able to get some time to work on this during the upcoming holidays. 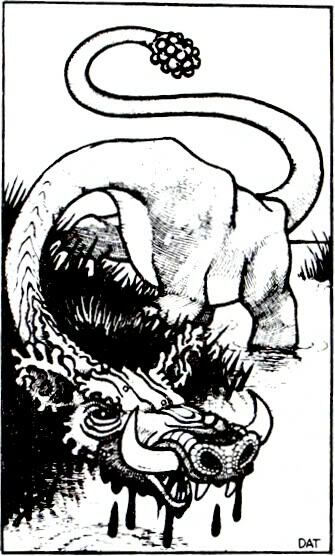 C. The D&D gorgon is the final creature that originates from the gnu. Essentially it merges elements of Aelianus' decription of the catoblepas with elements of Phalaris' brazen bull. "...it feeds upon poisonous roots. When it glares like a bull it immediately shudders and raises its mane, and when this has risen erect and the lips about its mouth are bared, it emits from its throat pungent and foul-smelling breath, so that the whole air overhead is infected, and any animals that approach and inhale it are grievously afflicted, lose their voice, and are seized with fatal convulsions." Two suitable old school gorgons for 25mm are the Ral Partha Gorgonian Brass Bull (02-410) and the Grenadier Iron Bull (Monster Manuscripts MM38). The brass bull has a mix of plates and scales, while the iron bull is completely covered in plates. Both miniatures are nice, but I'd like to get a model completely covered in scales like in the picture above. Reaper makes a miniature similar to this, but it is probably twice the size of either of my current gorgons, so it's way too big. D. And lastly, so as not to seem biased towards the gnu, I present the yak. hiss, spit and kick, and refuse to move. 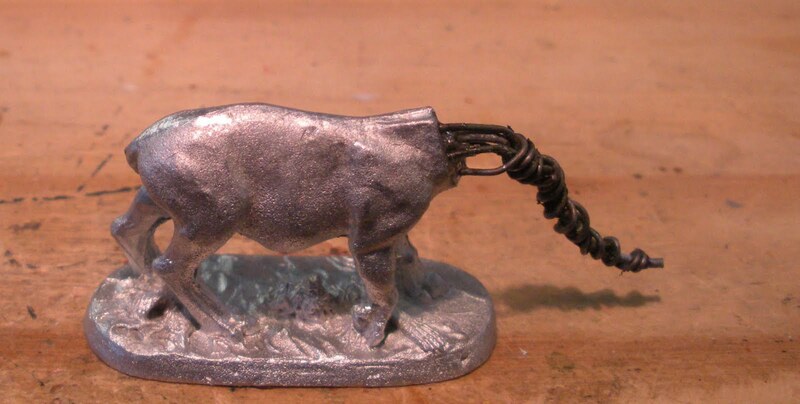 I know of three companies that make yak miniatures. Two of these companies' yaks are 28mm, and the third is listed as 25/28mm. Taking a chance that their yak would not be too big, I ordered the 25/28mm yak from Irregular Miniatures (AN22). Unfortunately, the Irregular yak is too big to use as a typical domestic yak (probably 1.6m or less at the shoulder). There are said to be wild yaks that are over 2m at the shoulder, so I suppose that the Irregular yak can be used as one of those. Can't wait to see it finished, it's looking good already, I've never tried actual sculpting (just a bit of filler occasionaly!!) and am envious of the skill!